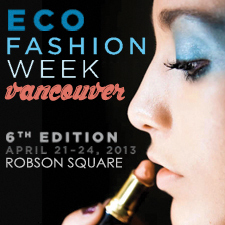 Green’s the new Tangerine Tango at Eco Fashion Week Vancouver! It’s no big secret that the fashion industry is one of the economy’s biggest sellers, bringing in over $300 billion in annual revenue. But how many of us stop mid-stride at the boutique or halfway through Vogue magazine to consider the cost? The truth is, it’s the world’s natural ecosystems and the stability of just societies that pay for this year’s pumps, not the corporate bank accounts. That’s why the fashion industry ranks third among the most environmentally damaging industries in the world. So what hope can we have for its long-term viability? Eco Fashion Week seeks to solve this riddle. By presenting sustainable innovations, solutions, and alternatives in fashion, modeled on the runways of the event’s numerous award-winning fashion shows. By building the capacity within the audience to align consumer values, intentions, and actions, through engaging seminars on topics like, “Designer Challenges and Solutions” and “Rethinking Second-Hand”. So prepare to see some serious innovation – think avant-garde vintage more than hemp-clad hippies – at Robson Square, April 21-24th; the type of innovation that makes a brand outlast its competitors through commitment to lasting change. Because, as we believe here at Kihada, a brand – and a branding agency, for that matter – should have a distinctive signature, not a sizable footprint. Find out more about these progressive ideas at Eco Fashion Week – and ask us how to make your brand more sustainable!